This week on RuPaul’s Drag Race, the queens got political -- and embraced their inner pun-dits with musical flair! After an emotional scene in the werk room following Honey Davenport’s elimination, it was time for a mini-challenge. "There's been a leak, and it's coming from inside this studio!" Mama Ru told the queens. "Soju's back?" cracked Silky Nutmeg Ganache. Drama queen Scarlet Envy came out on top and was awarded the chance to assign the roles in the maxi-challenge, a political twist on Ru’s favorite high school musical -- no, not that one, but Grease -- titled, Trump: The Rusical. Troubles arose almost immediately when Mercedes Iman Diamond volunteered to play the main role, "Shandi," but was quickly shot down by her fellow queens. Silky also wanted to play the role but was cast as Oprah instead, and the lead part went to Ariel Versace, who wanted to play Ivanka Trump, a part that ultimately went to Mercedes. After some initial stumbles with choreographer-to-the-stars Yanis Marshall and a "breakdown" from Ariel over the stress of being the lead -- "I did not think we would be doing the frickin' Beyonce halftime concert" -- the Rusical went off without a hitch, with a special appearance by Drag Race alum Ginger Minj as perfectly orange-faced Donald. Mercedes Iman Diamond couldn't survive her second time lip syncing for her life and was sent packing. The Minneapolis queen, who was born in Kenya, made history as the show's first Muslim queen, which she was originally hesitant to discuss with her sisters. ("I don't want people to hate me. I've seen crazy stuff on social media," she explained in tonight's episode.) 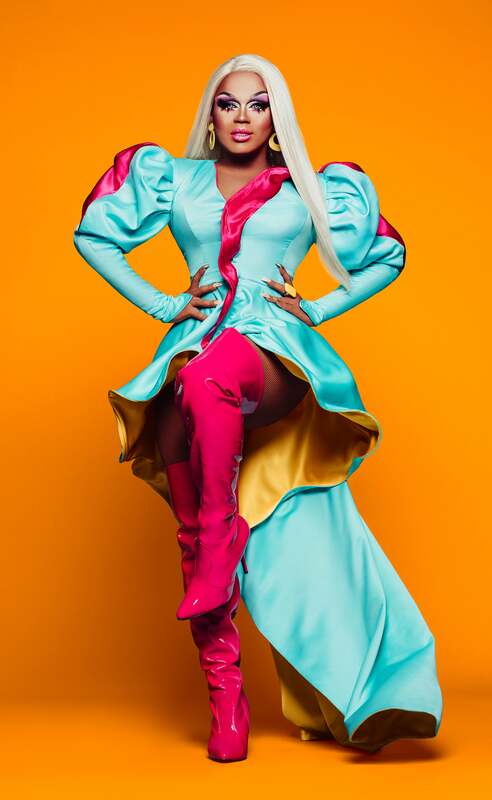 Ahead of the season 11 premiere, Mercedes opened up to ET's Brice Sander about her religion and what she learned on Drag Race. "I dreamt about this day. I was like, 'One day I will be on that show.' After [applying] five times, I finally made it," Mercedes opened up. "I know some of my family doesn't talk to me because they're like, 'Oh, this is against the religion.' But you can still believe in your religion and still follow your heart." ET: What does it mean to be the first Muslim queen and to bring that to the show and be a voice for your people? It's a blessing that I am counting on and I'm so grateful for it. I want to speak for other people that don't have a voice, that are scared to be who they are, that it's okay to be who you are and still believe in your religion. Because, at the end of the day, honey, you gotta be happy and follow your heart. And you followed your heart to Drag Race. If you had to sum up your Drag Race experience in just a couple of words, what would you say? You know what, what you see on TV is not the same as doing [it] in real life. It's a lot of work! People think, like, "Oh yeah, girl, I watch YouTube and I know how to do this and that and --" No, girl. It's not like that. This is real. It's not like YouTube things. It's real and it's a lot of work and it can be a little bit stressful at times, but just get out of your head and do the work. When this season is all said and done, what do you hope the fans walk away thinking about Mercedes? Hopefully they will say, "Wow, every Muslim person is not a terrorist." Because I was on the watch list for so many years and I had change my full name to get [off] the watch list. So, I couldn't fly. I couldn't go nowhere. That's the other reason why I wanted to come on this show and just be like, "It's OK to be who you are." People look at Muslim people as terrorists, and they combine us as one. One person did something and they're like, "Yep. The whole religion is terrorists." But hopefully they won't think that way [anymore]. Like, "Wow, they're not all the same." Did you just happen to have the same name as somebody on the list? Yeah, it was not easy. I had to prove the reason why I wanted to change my name and I was like, "I can't even do anything!" I literally was getting pulled over, like, driving. I would get pulled over for no reason and they would come up with an excuse like, "Oh, this is the reason why I pulled you over." And I'm like, "That's not an excuse, honey. You shouldn't pull me over for this." "Oh, we thought you were this person." And I'm like, no. Wow, that's crazy. Bringing it back to the show, this season seems like a very sisterly group. Did you walk away with friends for life? In my eyes, all the girls are my sisters. And I do actually communicate with them. We always talk and I just reach out to them and be like, "Hey girl, how are you? I hope you have a good weekend." Even if we don't talk a lot, I send them a text message just to check in on them and see how they're doing. Ariel, Soju, Plastique, Vanjie and then the rest, I check on them.